Theater in the Now: Review: They're Coming! From co-writers Phil Johnson and Ruff Yeager comes a vibrant nostalgia-driven campy parody of the b-movie horror flicks. 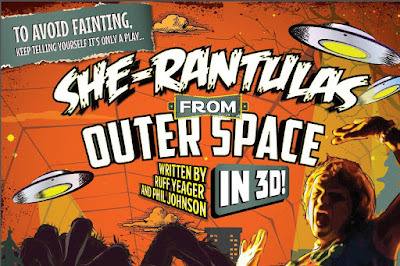 With shades of Charles Busch, She-Rantulas From Outer Space in 3-D is a horror comedy about an alien species that snatches up the men and turn them into women. Littered with sexual innuendo and alliteration, the writing is smart and sharp. The duo has done their research. They evoked the period well. They picked the arachnid for a very specific reason. And it allowed the drag element to prosper. But there also happened to be much repetition that needs to be trimmed. Each scene followed the same model. Betty made a new companion. That companion either died or disappeared and dastardly daughter Suzie had something to do with it. With so much of the same thing, it just got bland. Stylistically, the campy nature was alive and kicking. But some of the jokes just didn't land. Nor did the vision. With cowriters Johnson and Yeager in prominent roles as Betty and director respectively, the strong potential of the piece was lost. 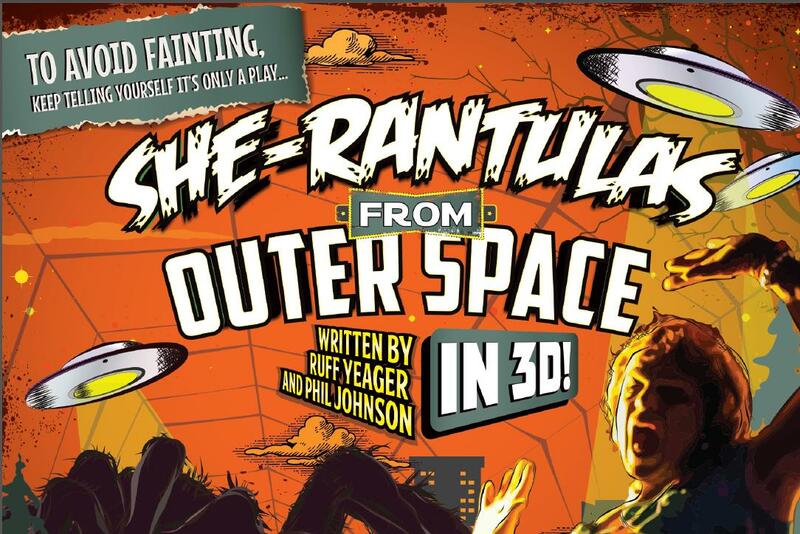 She-Rantulas From Outer Space in 3-D is in desperate need of a separate director. A fresh eye could bring out the promise of the play. And if the 3-D is essential, it needs to go further. Much further. Yeager only touched upon it and it appeared way too late. You got the gimmick, now do it or remove it from the title. The drag element was a strong factor in the play but leave it to the only woman in the comedy to steal the show. Playing an assortment of characters, each with their own voice, Samantha Ginn, the lone lady, was beyond brilliant. She is clearly no stranger to comedy and it shows. Ginn was on point and gave the piece a much needed boost. As Betty, Phil Johnson played upon the hysterics and nativity of the 1950s housewife. Though Johnson seemed to be the only one to include the over the top b-film acting. Tony Houck as Suzie had his moments but the character came off as confused and incoherent. Fred Harlow and Andy Collins did double duty of characters, both shining as the female counterparts. Looks are everything. And the production value was on point. The 50s inspired set with colorful backdrops and retro furniture evoked the time. The costumes by Jennifer Brawn Gittings and wig and makeup by Peter Herman were brilliant. And though those costume changes could use some finessing, the different looks for each scene and character truly paid off. The one aspect of the overall design that could be adjusted was the use of music. To bring out the film-mocking aspect of the play, more dramatic underscoring from sound designer Kevin Anthenil is essential. It will add to the heightened campy nature. She-Rantulas From Outer Space in 3-D has all the makings of something great, but there is a strong perspective that is missing. Bringing in that fresh vision can take this piece to the next level. But that will require giving up some ownership.